Home › life › Here Is A Chemical-Free And Effective Way To Clean The Dashboard OF Your Car! 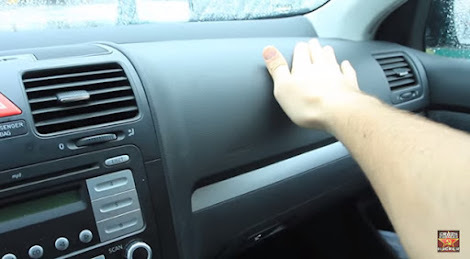 Here Is A Chemical-Free And Effective Way To Clean The Dashboard OF Your Car! The cleaning of the dashboard, doors and center console of your car is something you have to do no matter how new or old your car is. Some of the detergents which we know out there are made of chemicals that smell awful which you will not love to smell when trapped in a space that is enclosed. Why risk our health when there is something safe which we can substitute the dangerous chemicals with? In the video below, The Russian Hacker demonstrates how we can use olive oil and some tissue to clean the interior of our car. We all know olive oil is good for our health and it even feels well in your hands when using it to do the cleaning. Watch below how he does and the amazing results he gets at the end. There are some who have also said that baby oil can also be used in place of olive oil. What other cheap car cleaning tips do you have to share with us? Please SHARE with your Facebook friends!